On 19 March 2010 I was the subject of a Professional Conduct Hearing of the British Association for Counselling & Psychotherapy (BACP) of which I was a member. I went into the hearing acknowledging and apologising for certain wrongdoings and having caused hurt and offence to the complainant and his wife. However, I was convinced I could clear my good name of the more spurious allegations of the complainant. Due to the manner in which the hearing was conducted, I found it a harrowing and traumatic experience. On 20 March I wrote to Professor Cary Cooper, President of the BACP, complaining of procedural irregularities, clear bias to the complainant and unethical treatment of myself amounting to a breach of my Human Rights. I also queried the competence of the hearing committee. At least one member is supposed be of the same theoretical orientation as myself but no member showed any understanding of either the Gravesian approach (vMEMES) or NLP. The committee members also displayed an alarming degree of ignorance with regard to Hans J Eysenck’s Dimensions of Temperament. On 26 March the hearing committee declared me guilty of “professional malpractice on the grounds of incompetence, recklessness, negligence, and the provision of inadequate services”. I was also found to have breached the complainant’s trust and confidentiality and told that I had to go on a “counsellor/psychotherapy training course” – BACP-accredited, of course! The BAPC made the judgement public earlier this month. It needs to be understood clearly by anyone reading it that the judgement has no legal standing whatsoever and the BACP cannot enforce the sanctions they have imposed. The most the BACP can do to a member who does not comply with sanctions is to withdraw their membership. I have already resigned due to Mr Clarke’s refusal to provide me with reassurances as to the integrity of the appeals process. The BACP is just one of several professional associations for counsellors and/or psychotherapists. Membership is voluntary. Unlike the General Medical Council (GMC) or the General Teaching Council (GTC), the BAPC has no statutory powers. Unlike the GMC and the GTC, the BACP is not sponsored by or responsible to a government department…or, for that matter, any other body. Governance and accountability are strictly internal affairs. There is no regulation of counselling or psychotherapy in the UK at the moment; but the BACP, like several other professional associations, is seeking to shape government proposals for regulation. Thus, demonstrating it can flush out, shame and punish ‘incompetent’ counsellors and therapists and force them into remedial measures is an important plank in the BACP’s strategy for influencing the way regulation is designed and enforced. It should be noted here that the Professional Guild of NLP have accepted my qualifications as demonstrating competence, as have my insurers for professional indemnity. I was asked by the parents and commissioned by the pertinent department of a local authority to provide counselling and support for a boy who was struggling with emotional and behavioural issues. As the local authority has legal responsibility to ensure providers in such instances are competent, the view of the local authority (legal responsibility) as to my competence clearly contradicts with that of the BACP (no legal responsibility). The boy made progress during the time I worked with him – though the parents and others also made equally important contributions – and the parents expressed real satisfaction with this progress. Although the complainant subsequently enquired to the BAPC about my competency to counsel vulnerable children, at no stage have the parents expressed dissatisfaction with the support I gave their son or refuted the concept that my support contributed to his progress. In fact, I have e-mails and records of telephone conversations in which they specifically attributed elements of his progress to my interventions. When the funding from one department of the local authority ran out, the parents campaigned vociferously to get funding out of another department to continue the work! Unfortunately – and this is to my shame – I made oblique comments about the parents and the support on the Facebook page I then ran. I did not – and still do not – believe that the comments made the family identifiable to anyone in whom they had not previously confided. Thus, I contend I did not breach confidentiality. However, the parents recognised themselves in the comments and, thus, there is no doubt I breached their trust and caused them hurt and offence. I have apologised several times to the parents for these errors in judgement – and I do so again by this page. (I can only attribute the ‘mindblindedness’ that led me to make the errors to my own mild Psychoticism.) There is no getting away from the fact I betrayed their trust and caused hurt and offence. For that I am deeply sorry. Again the view of the BACP (no legal responsibility) seems to contradict that of the local authority (full legal responsibility). While I acknowledge fully that it was my errors of judgement that created the situation and that I caused serious hurt and offence to the parents concerned – and also betrayed the trust of those in the local authority who had contracted me – the stress and anguish my family and I have experienced in the past year has been all but unbearable. This is compounded by a gross sense of unfair, inaccurate, unjust and unethical treatment by the BAPC. I learned today that the complainant, having said at the 19 March hearing that he wanted to draw a line under the whole affair, is in fact using the BACP judgement of my supposed ‘incompetence’ to pursue what appears to be a vendetta against the local authority manager who first commissioned me to work with his son, alleging mismanagement by commissioning someone ‘incompetent’. (Several earlier complaints by the complainant against this manager had been investigated and largely repudiated by the local authority.) This illustrates how damaging such a careless, biased and erroneous judgement as that given by the BACP can be when put in malicious hands! As part of their investigation the local authority interrogated the headteacher, Pat Hunter, of my school (Rossett) about my activities. The Head told the local authority that there was no case to answer in any respect of my activities and that she was more than satisfied with my performance and conduct in relation to all aspects of school life. I have also learned that the local authority at some point quizzed the son of the complainant. He and his wife must have been galled by their child telling the local authority investigator that he enjoyed the sessions with me and found them useful! BACP Membership Services sent a request (20 July) for me to renew the membership I had resigned back in May just 2 days before the Sanctions Panel withdrew (22 July) my non-existent membership as a consequence of my non-compliance with their sanctions. Dr Lynne Gabriel only wrote to inform me of the withdrawal on 30 July, though her letter seems not to have been posted until 13 August. In her letter Dr Gabriel acknowledges that I sent a letter on 7 May but does not acknowledge that it was addressed to her and makes no reference whatsoever to its contents – my resignation and the reasons why. I said in the letter of 7 May that I did not “anticipate any kind of meaningful response from” her….and I certainly didn’t get one! As per every 3 years, the school at which I teach Psychology, Sociology and Health & Social Care, requires me to submit a new application for clearance from the Criminal Records Bureau (CRB) . The CRB was created to help schools, orphanages, nurseries. hospitals, care homes, social service units, etc identify (from police and other databases) persons unsuitable to work with children or other vulnerable people. CRB checking criteria has tightened considerably over the years and now includes even warnings and reprimands. At my own discretion, I chose to submit a half-page description of the parents’ complaint to the police and to the local authority with the next CRB re-application. I included the police case reference number (12090078331) to facilitate the CRB investigating thoroughly. As I expected, the consequent CRB Disclosure Form – the July 2011 updated check is reproduced below – shows that I do not have even a caution, warning or reprimand. This refutes beyond all possible doubt the parents’ allegations that I put their child (or any other children) at risk. It also refutes the BACP’s findings that I was reckless and negligent. If I had been either of those, simply by virtue of those terms, the child would have been placed at risk. In that the CRB check does not find any judgement or other indication of legal standing that I placed any child at risk, the BACP judgement is rendered null and void. It seems I’m far from being the only counsellor/therapist to feel aggrieved at being treated unjustly via a BACP Professional Conduct Hearing. There is now a web site – www.justice4counsellorsuk.net – dedicated to exposing the bias and lack of professionalism in the BACP’s disciplinary processes. Please note: some minor omissions have been made to protect confidentiality. Also in the correspondence, the complainant is referred to as ‘Mr A’. I am writing to express my dismay and disquiet at the way I was treated yesterday in a Professional Conduct Hearing – 588301. I went to the Hearing, already admitting to 2 violations of the Ethical Framework but convinced I would be able to defend my good name against the more lurid allegations made by Mr A, the complainant. By lunchtime I had completely lost faith in the process and was ready to walk out. When I eventually left, I was seething with frustration, feeling angry and humiliated and having a total sense of injustice. My principal grievance, though, is with the behaviour of Mr Brightmore who conducted himself in what I experienced as a persecutory manner. Mr Brightmore repeatedly pushed for the admission that I do not have specific qualifications in child counselling/therapy and was dismissive of my contention that the models and theoretical orientations I work with (Neuro-Linguistic Programming and Spiral Dynamics) are considered universally applicable once the cognitive capability of the child and their emotional state are calibrated for – which I demonstrated I had done. Mr Brightmore was dismissive in ignoring my assertions, the vocal tone (sighs) in which he did this and his body language – eg: raised eyebrows, rolling of the eyes – being all too obvious. Mr Brightmore then challenged me on the basis that I felt it ethical to work with vulnerable children when I didn’t have the (in his view) requisite qualifications. I had never pretended to have the qualifications to which he refers but reiterated that the models and theoretical orientation I work with are considered suitable for work with young children, given the caveats I have mentioned. 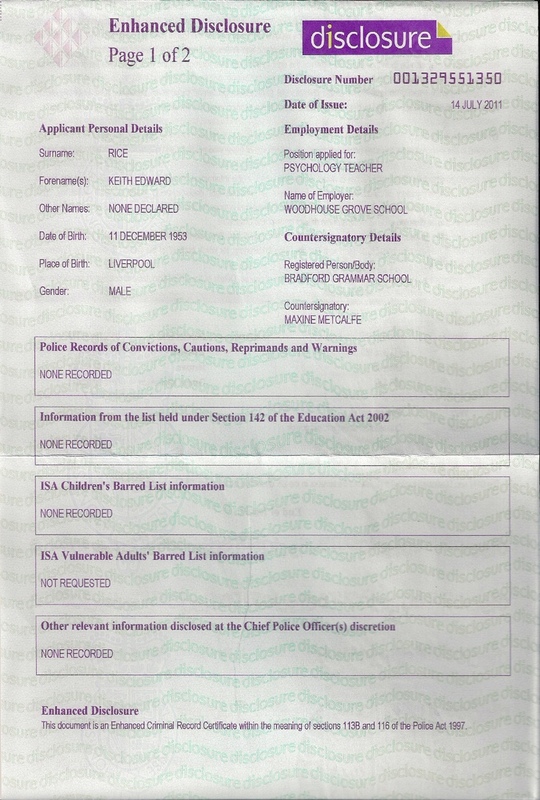 Mr Brightmore gave every impression of ignoring my telling him of successes in the work I do and, in particular, of my work with vulnerable children being thought highly enough of by *** Council that I was approached by one of their behaviour experts to work with [phrase removed for confidentiality purposes]. These machinations to destroy my credibility were carried out in full view and hearing of the complainant – totally inappropriate in my view. [Sentence removed for confidentiality purposes]. Therefore, Mr Brightmore’s ‘hatchet job’ attempt to demonstrate my unsuitability in his view in front of the complainant was totally inappropriate and, I would contend, unethical – demonstrating complete lack of consideration for my person or my situation. At this stage I objected, told Mr Brightmore I found his line of questioning aggressive and told Chair Ms Dale that I was ready to walk out of the proceedings. Only then did Ms Dale attempt to control Mr Brightmore. Ms Dale did apologise, not for Mr Brightmore’s behaviour, but that I felt uncomfortable. Mr Brightmore made a token mumble and nod of the head to signify he concurred with Ms Dale. Earlier, Ms Dale had obliged me to say Yes or No as to whether I agreed with BACP’s interpretation of which clauses of the Ethical Framework I had breached. I was not allowed to indicate whether there might be a lesser or greater degree of breaching. Ms Dale’s all-or-nothing approach to complex, multi-faceted clauses I find not only to be terribly simplistic but also in breach of my Human Right to put forward my case. Although I repeatedly stated that Psychoticism was not the principal focus of my approach and that the Spiral Dynamics model and Robert Dilts’ Neurological Levels were generally much more useful to me and used by me more with Mr A’s son, Mr Brightmore and Mr McInnes showed bias towards Mr A’s insistence that Psychoticism was my main focus by ignoring my references to other theories and models and instead focussing on Psychoticism. (Listen to the recording: only one question was asked about Spiral Dynamics; no questions were asked about Neurological Levels.) Moreover, they demonstrated bias, when questioning me, by picking up on Mr A’s question as to whether I had tested his son biologically for Psychoticism – ie: measured for testosterone. When I said No, that was the end of the matter as far as Mr McInnes and Mr Brightmore were concerned. No one asked me about behavioural measures (which were plentiful). I can only assume this lack of insight was due to either bias or ignorance of the psychological concept under discussion. Ms Dale and Mr Brightmore have hinted that I will be found to be in breach of confidentiality. As I pointed out to them, if *** Council, who have legal responsibility in a way the BACP does not, have not found me to be in breach of confidentiality – only that I acted inappropriately – then how can the BACP find differently? This would imply that the lesser body is out of synch with government-directed thinking. (Given the current concerns about safeguarding – OFSTED’s number 1 priority – *** Council would have subjected me to disciplinary proceedings and more than likely have had me suspended if there were serious concerns. None of which took place. If BACP is not interpreting confidentiality with respect to child protection issues in the same way as government departments and local authorities, I would strongly urge BACP to reconsider its definition and understanding of confidentiality in these matters. Such was my upset at the treatment afforded me by Ms Dale and Mr Brightmore that I do not consider I presented my best arguments in the later stages of the proceedings. At the close of proceedings, Ms Dale asked Mr A and I if we felt we felt we had been heard. Having by this time effectively given up, I said Yes. I should have said No – since I wasn’t allowed to voice my degree of admission to breaches – a violation of my Human Rights. I certainly do not feel I had a just hearing. Is it not ironic that I am put under scrutiny for allegations of ethical failings, some of which I shame-facedly admit to, by people who treat me with near-complete disdain? I have no faith that there will be a just outcome from these proceedings. This is my only face-to-face experience with the BACP…and I meet people whose focus is rigid and bureaucratic, with apparent scant regard for the well-being of those they are dealing with. I am currently considering my position, as to whether I wish to be associated with such an organisation. I look forward to receiving your comments on this matter. I am responding on behalf of Professor Cooper, to your letter dated 20 March regarding the Professional Conduct Hearing on 19 March. Neither myself nor Professor Cooper can respond to a professional conduct case until it is formally concluded. I have, therefore, passed your letter on to the Professional Conduct senior manager for attention.